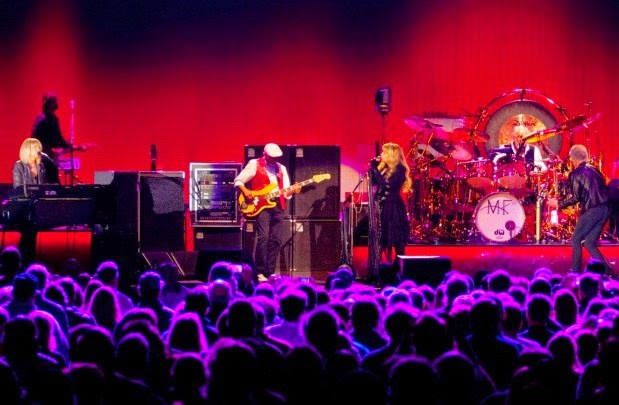 Rock legends Stevie Nicks, Lindsey Buckingham, Christine McVie, John McVie, and Mick Fleetwood jammed together as if no time had passed during their jaunt to Tacoma, Washington on November 20, 2014. Nicks had an unusually intimate moment with the nearly sold-out crowd before belting out one of her most recognizable tunes. The 66-year-old shared that prior to her 40-year career with Fleetwood Mac she dreamed of going into the rock n’ roll clothing paradise known as the Velvet Underground and purchasing her “rock n’roll clothes.” When Fleetwood Mac took off, she returned to the place she loved. “So I’m back, to the velvet underground…back to the floor that I love. To a room with some lace and paper flowers,” Nicks playfully recalled. Then she sped off into the song as only she could.